Gary Pierce (left) and Jordan Santiago (right) in The Christmas Schooner. 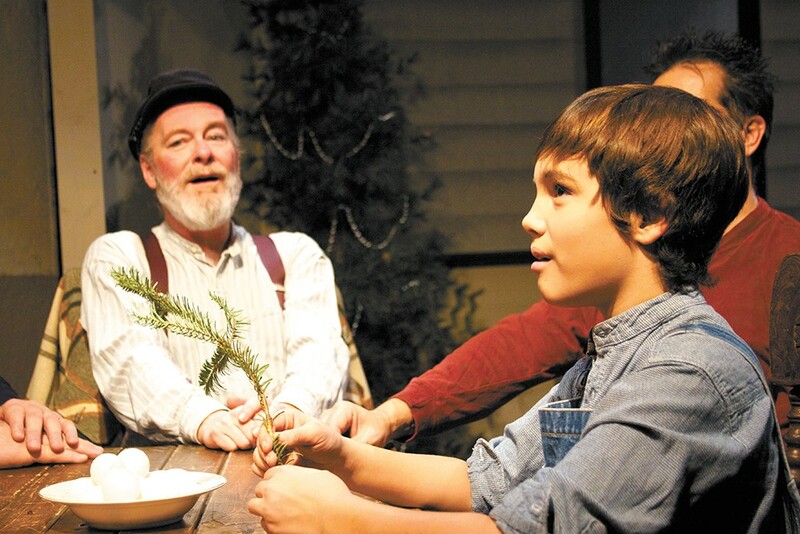 While most local theater groups are staging variations of some of the most recognizable holiday-themed productions in the business, it should be easy for the Spokane Civic Theatre's The Christmas Schooner to stand out. That's the least of what can be assumed from its choice to produce the lesser-known script of The Christmas Schooner, an unfamiliar title on a list of multiple Christmas Carols and Best Christmas Pageants being produced at community theaters across the Inland Northwest this season. It's a refreshing step away from the expected, especially considering the Civic's choice last year to stage a repeat performance of the Bing Crosby classic White Christmas for the second time in three years. Yet despite the lackluster critical reception it received, something like White Christmas may be just what people want to see during the holidays. It's familiar. It's a classic — a traditional go-see for many this time of year when our nostalgia for old tradition runs high. The inability of audiences unfamiliar with the story to anticipate what happens next in the two-hour-long Christmas Schooner, which the Civic last produced in 2007, is what makes the plot seem so plodding. Based on historical events during the 1880s, the musical originally premiered in 1996 and was acclaimed during a continuous 12-year run at Chicago's Bailiwick Repertory Theatre. Directed at the Civic by Scott Doughty, the stage version's ship is christened the Molly Doone, but the historical tale took place aboard a vessel of a different name, the Rouse Simmons. During its wintertime break from transporting lumber across the expansive Great Lakes, the schooner transported Christmas trees. As The Christmas Schooner depicts, the ship's captain Peter Stossel (played here by Bryan Agee) and crew risked their lives each December to bring evergreens from remote Michigan forests across Lake Michigan's frigid waters to homesick German immigrants in industrial-era Chicago. Known as "The Christmas Tree Ship," the real-life schooner and its crew eventually met their demise in a violent storm off the coast of Wisconsin. No spoiler here, but the play handles this historical fact a little differently. As tedious as the plot may be — trudging through several years of passing time that does little else but confuse — it does lightly explore some deep emotions and human traits: cultural identity, the importance of family and the spirit of generosity. The musical's original songs are forgettable, but the cast does its best to present the story at hand. Without question, The Christmas Schooner's standout character is the ruddy-faced, stubborn grandfather Gustav Stossel, played by returning Civic alum Gary Pierce. Gustav's asides are genuinely funny, and his role as the "glue" that both binds the family together and stirs heated disagreements is believable and sincere. Joining Pierce as part of the Stossel family, Agee plays the thoughtful, selfless breadwinner, returning to the stage for the second time after a minor role in the Civic's spectacular production of Les Misérables. Though Agee's Peter Stossel is true to form, his portrayal comes off as a little too eager to risk his life and leave his family behind, especially when contrasted with Heidi Santiago's Alma Stossel, Peter's doting yet fretful wife.